Our dedicated centre is situated in a country living area on the outskirts of Hamilton city. This space provides room for many outdoor activities and animals. The garden is tended by the children and presents real opportunities for observing and interacting with the natural world. Our school is a Montessori community of supportive families, dedicated teachers and staff, and joyful learners. Where children achieve individual fulfillment and are inspired to a lifetime love of learning. We have a holistic approach to nurturing children’s development, where a love of learning occurs naturally. We encourage independence and self discipline. Montessori consciously teaches children to be kind and considerate of each other – a community of respectful young learners is formed. Our Montessori curriculum covers practical life exercises, sensorial materials, and academic materials to awaken each child’s interest in literacy, mathematics, science, botany, biology, geography and history. True wisdom is the ability to listen to your heart and know how best to put your intelligence to work for you. In order to guide this development, self-esteem, human dignity, and emotional well being, as well as the ability to communicate and cooperate effectively with others, are valued at least as highly as academic achievement. Parent evenings are held each term where regular enthusiastic participation is the norm. Information on Montessori philosophy is presented and related to parenting at home in a Montessori way. Social times are also offered during the year where families share time in the classroom with their children. Parental understanding of the Montessori approach is encouraged and supported. We welcome visitors by appointment – this allows us to manage classroom disruptions and ensures we can give visitors attention to answer questions that arise. Visiting our Centre is the most effective way to determine if we are a match for your family’s needs. 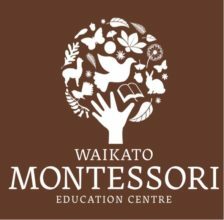 We have an Enrolment Policy which is downloadable from our website, along with an Enrolment Application Form at www.waikatomontessori.org.nz. Applications are managed in date sequence. Final confirmation of a start date will be discussed as your child nears 3 yrs old for the early childhood programme. Places are limited and early pre-enrolment is encouraged, generally by 2 yrs old to be assured of a place being available in early childhood and by 5 yrs old for the primary programme. Commencing Age: As children are developmentally ready which is generally sometime between 2 yrs 9 mths and 3 yrs old. Attendance: Initially a minimum of 3 mornings until 12pm is required. This builds incrementally to 5 mornings and 5 full days by the time children are 5yrs old. Charges: Enrolment fee is payable once a starting date is confirmed. Thereafter a fixed and flat donation per term is requested. Contact us for the current information. Capacity: Licensed for 50 children 3-6yrs old, and 50 children 6-12yrs old. Facility: Our facility comprises three large classrooms each accessing spacious grounds and gardens.